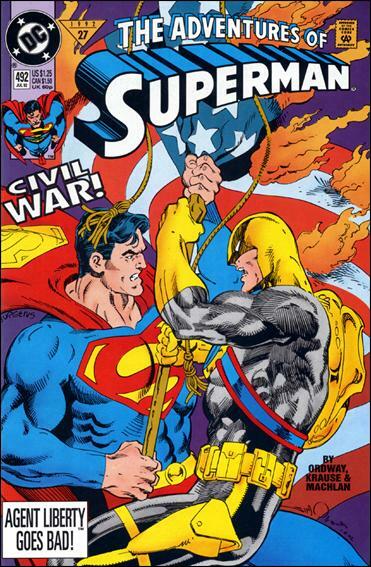 Continued from Superman (1987) #69, continues in Action Comics (1938) #679. Wrongfully imprisoned for murder by the Sons of Liberty in Wakefield penitentiary, Senator Peter Ross's innocence must now be proven by Superman and the assassin who framed him, Agent Liberty. When Agent Liberty learns that it was the Sons who killed Senator Caldwell he experiences a crisis of conscience - is he working for the right people? Digging deeper, he learns how dirty his own organization is and aims to take them down while clearing Ross at the same time. This is the end of the Sons, is it the end of Agent Liberty too?